We had a friend visiting for a few days recently and so the family was doing the tourist thing. We were totally open to what ever our friend wanted to do and, when I mentioned wine tasting in Temecula her eyes lit up! She especially wanted to do the wine tasting since Youngest Daughter just turned 21 and both girls could participate in the experience. Hubby and I have only been wine tasting once before since we are not huge wine aficionados. Well, that is an understatement. We almost never drink wine. But wine tasting is another story. Even though I don’t drink wine I find it quite fun to go wine tasting. First we read the description of the wine, and then we taste. Sure enough, even though itt is sounds odd we did find that one wine was earthy, another had a tobacco tone, and another mineral overtones. None of us were interested in getting a big buzz on from this experience. We just wanted to have some fun together. We also wanted to avoid the crowds and decided to go on a Friday. The main wine tasting area in the Temecula Valley is Rancho California Road. That is where some of the well-known corporate names in wine making are located such as Callaway and Thornton. I decided to take the road less traveled and we went to De Portola Road instead. It has fewer wineries and they are all smaller and more likely to be individually owned. We stopped at three: Keystone, Frangipani, and Cougar. The wine tastings cost from $10 to $12 for 5 – 6 tastings. However, the people pouring the wine were always very generous and we usually got at least one more tasting than what we paid for. All of the wineries were also very accommodating in that they allowed all five of us to sip from one tasting. You might think that five people and one ounce of wine wouldn’t work but we all managed to have a taste and often there was even a little left over. This allowed lots of wine tasting without me, the designated driver, having to deal with overly happy passengers. I appreciated that because I have never found being the only sober person in a group of drunk people to be fun…if you know what I mean! We had a very fun day. Wine tasting in Inland So Cal is a great activity to do with out-of-town guests or just as a fun get away for yourself and family or friends. There are limousine wine tours for those who want to enjoy the full taste of each wine and not spend the night in jail for drunk driving! The country side is beautiful as well for folks who may just want to enjoy a nice drive. I was at work as usual this morning. I work at the front counter, answering questions. Because I am at the counter in the lobby, I can actually look out the front windows if I want to, which is nice. Since I get to work at 7:30 in the morning it is nice to look out an hour or so later and see if the sun came up or if it is cloudy, and just to be able to see the outside world. However, I never expected to see what I saw today! I was minding my own business with my eyes glued to a computer screen when a coworker said, in a surprised kind of voice, “There is a parachutist in the middle of the street!” I looked up and, sure enough, there was a fellow in full gear, including a helmet with a little camera on it, standing in the street. His parachute was all bunched up and stuffed on some side pouch or bag, but there was still plenty of colorful nylon spilling out. He seemed to be waiting for his ride and maybe trying to figure out where he was. I have no idea where he landed initially, but there are several large fields around my workplace that could do for a landing spot. I certainly didn’t expect to see a parachutist when I went to work today. Have you ever looked out a window at work and seen something wildly unexpected? If so, please tell me about it! With the ingredients above I had enough cake and cool whip for three layers but only enough pudding for two. So you will see below how I put my layers together. 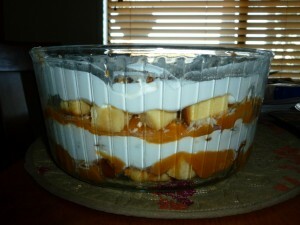 But, this is an easy dessert and will taste wonderful no matter how you layer it, so do as you like with the layering. How many layers you will have will also depend on the dish you are using as well. The only thing is do not let the cake be the last layer because it might ge kind of dry if it is not encased in delicious pudding or cool whip. Cut pound cake into small squares. Put a layer on bottom of dish. Sprinkle with Amaretto. Cover with 1/2 pudding. Sprinkle with brickle bits. Add a layer of cool whip. Sprinkle with nuts. Add a layer of cake and sprinkle with Amaretto. Spread with other 1/2 of pudding and sprinkle with brickle bits. Add another layer of cake and sprinkle with Amaretto. Cover with cool whip and sprinkle with nuts. Refrigerate until dessert time. I do not have a lot of experience in food photography so this is the best I was able to do. But it shows you the type of dish I used and the layers of the dessert. If I do say so myself, this was very yummy! The Amaretto really put it over the top and made it delicious! This summer Hubby and I will be going on a once in a lifetime trip to northern Europe. I have had the desire to visit St. Petersburg, Russia on my bucket list for a long time. So, after 5 years of planning, it is going to happen! 1. Shoes are my downfall. I believe in keeping my feet happy as all costs, especially on vacation. So that means extra shoes. Since my feet are not what you might call “delicate” that makes for a lot of room taken up by shoes. I know I can stuff things inside them, but it is still an issue. 2. I really do not like washing clothes in the sink if I can avoid it. After all, it is vacation! However, I would rather wash clothes in the sink than take a big suitcase, so we shall see. 2. I discovered that what they say is true – rolling your clothes makes them much smaller. I learned this when I sent Eldest Daughter to NYC for two weeks with only a carry on. I couldn’t believe what we fit in that suitcase just because we rolled her clothes! We actually added things that she was not originally going to take because we had so much room even after everything was packed. 3. I know we will want to take advantage of certain things on the cruise like the formal night and will want to dress accordingly. So clothes will be going in the suitcase that I do not normally take on my trips. Happily, some of this problem will be solved by a dress I have already purchased on clearance at the end of last summer. It is polyester so it won’t wrinkle and it will not take up much room. It will probably be the only dress I take so I have a feeling it will be showing up in a lot of photos…. 4. I will be taking my thinnest and lightest pants. I will not be packing heavy jeans but will take thin jeans, leggings, and /or khakis. I will also be taking a couple of pairs of Capri length pants. The Capris have less material so they take up less room and they will work everywhere except on the coldest days. 5. I plan on taking thin underwear so if I do decide to wash them they will dry quickly. I still haven’t decided if I will be taking enough for the whole trip or if I will be washing in the sink. 6. My much larger challenge is getting Hubby’s clothes in the smallest possible suitcase. The man loves his Levis and those are big and bulky! His feet are bigger, his underwear are bigger, his socks are bigger….and none of it will be easy to wash in a sink and get to dry in a timely fashion. On the plus side, he will only need two pairs of shoes – his usual Reeboks and a dressier black pair of shoes. Those Reeboks live on his feet day in and day out and when they fall apart they are just replaced by another pair of the same thing. I will just make sure he has a relatively new pair to take and he will be set! Do any of you out there in reader land have any helpful packing tips? I would love to hear them! Today is the 21st birthday of my youngest child. People, how is that possible??? Obviously, when I look at my child I can see that she is an adult. I have watched her grow up. I have about a million photos to prove it. There are papers tucked away that show mile stones have been reached such as middle school graduation, first drivers licence, high school graduation, etc… She even had to sit on a jury last summer, for a child molester no less. I have been there for all of it, even if I didn’t want to be (please don’t ever make me teach someone to drive again). And yet I am still shocked and surprised to find myself the mother of not one but two daughters that are 21 and older. My how time flies, and yet I feel like I am just 30 or so most of the time. Well, except for the first five months I was 30 when I was pregnant with said 21-year-old daughter. I don’t feel pregnant, I am happy to report. Gosh, folks, my life is so busy right now! Between kids, pets, house, work, writing, community activities….I sometimes have a hard time knowing what day it is! So I thought I would give you an update post on various things. 1. So Cal Weather – I know I am somewhat obsessed with the weather. But with the ever-changing weather here in inland So Cal it gives me lots to talk about. Just a week ago it was raining and cold. Then we got some nice spring weather, even though it isn’t quite spring yet. Yesterday it was 95! Yep, 95 in the first half of March! So we went from Winter to summer in one week! I have no idea what to wear. Some parts of my body (OK, all of my body) are not ready to be on display but I really wanted to be wearing something briefer and cooler than work clothes yesterday! 2. Honey the Dog – I am happy to report that Honey is doing a bit better, finally. After two weeks of eating poorly she is finally chowing down a bit better and yesterday we started her on her medicine for Cushing’s disease. Cross you fingers that it goes well. Honey has been the picture of stunning good health for her first 12 1/2 years so we were expecting several more years of companionship. These last three weeks have thrown us for a bit of a loop so we are hoping that the worst is over and we can go back to a Happy Honey! 3. The New Job – The new job is going well. I have a background in planning and I am working the public planning counter in a nearby city The people I work with seem to like what I am doing. For the most part the time flies which I love. Nothing is more miserable than sitting at a desk bored out of your skull! Every day brings in new questions from the public which keeps me hopping. If I could move the job a bit closer to home it would be perfect. 4. Spring Vacation – That subject brings just one word to mind – HA! We had a five-day trip to Seattle planned and paid for next week to visit a dear friend. It was all based around my two daughter’s finals schedules. Our daughters checked online to see when their finals were and, happily, both got done very early in finals week. So I bought plane tickets and we started planning. Then Eldest Daughter got an email that said her final was going to be the 21st. What? Is was supposed to be the 16th! Our tickets had us leaving on the 20th! At that point the whole thing began to fall apart. Then, happily, our friend said instead of us going up there she could come down here. Since the main purpose of the trip was to see her and seeing Seattle was just a bonus but not a necessity, we put our tickets on hold and she bought a ticket with her frequent flyer miles. All’s well that ends well, I guess! We had a little earthquake in these here parts yesterday morning. There is certainly nothing unusual about that. What made it a little different was where and how I experienced it. I wanted to talk to Hubby when I took my break at work so I decided to just go sit in my car and not inflict loud cell phone talk on my coworkers in the break room. As I sat there chatting I felt my car bob around a bit but thought it was because a car was driving behind me. Then I felt the car bob and weave even more. I looked around and the trees weren’t moving so it couldn’t be the wind…then I looked in my rear view mirror and there wasn’t a car driving by…then I looked at the motorcycle beside me and it was bobbing and weaving as well. That is when I mentioned to Hubby all of this and said “I wonder if it was an earthquake.” He replied “yeah, it was an earthquake, I just felt it!” So, something new today, as I had never been sitting in a stationary car when an earthquake hit. It was very weird! Since I hadn’t worked in an office in a year and a half prior to starting my new job a month ago I had forgotten what it was like to be amongst lots of other people in the immediate after math of a trembler. I walked back in the building and asked, “Did you feel the earthquake?” Thay certainly had and it was definitely the topic of conversation for the rest of the morning. If I had been at home I would have called hubby, exchanged a few words about it, and then gone on on with my day. There is something about experiencing a possible natural disaster with a bunch of other people that just, somehow, makes it seem more real and more, well, BIG. Please forgive me that I am little behind in my blogging. Trying to balance life and new job is a challenge at times. I hope you enjoy the following true story. Carol has a large client list and she quickly flipped through some names until she spied a person that works for the city’s street department. She called her client right then and there and explained the problem. Her client’s response was “Oh Nooo, they did what?” Carol’s client vowed to have the sign out of Carol’s front yard the next day. Seriously, do not mess with a hairdresser. They KNOW people!!! Be careful what you do with your fake leg. Some folks in a nearby city learned that the hard way! It seems a man was driving along in his SUV when he spotted – GASP! – a leg sticking out from under a parked car! He veered over to get a closer look but was apparently so flustered that he did not properly pay attention to his speed or where he was going. He rammed the parked car under which the leg resided and it rammed the car in front of it which, in turn, hit the car in front of it. When the officer arrived at the scene the first driver told him about the leg. The officer walked over and, sure enough, there in the middle of the road was a fake leg! By this time the owners of the three parked cars had arrived and the woman who owned the car under which the fake leg was originally located admitted that she had placed the leg there. There was no report on what the heck she was thinking! If you are wondering, the first guy was cited for not driving in a straight line and for failure to apply his brakes. So let this be a lesson – someone else’s lame attempt at humor does not absolve you from needing to use your brain! The table in my dining room is right by the front door. That makes it a very convenient spot to dump things on occasion. Such was the case a few weeks ago. I had just been involved in a big fundraising event that involved lots of women and lots of snacks. All the leftover snacks, plasitc bowls, and other bits and pieces that came back from the event ended up on my dining room table. The tablecloth had been pulled almost completely off the table. Snack mix was spilled everywhere. And one bag was perched at the very edge of the table, holding one last corner of the tablecloth on the table. 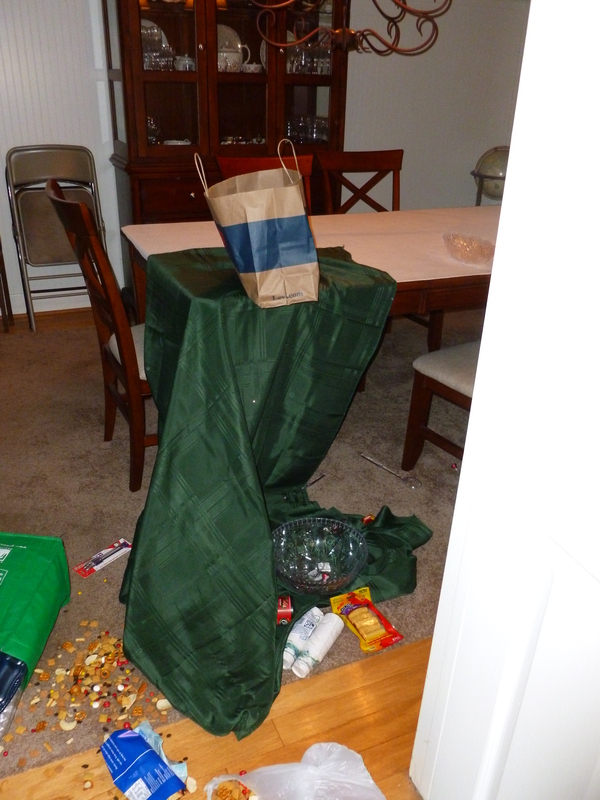 Oh, and I guess a few things I had picked up at the dollar store were in the table (now on the floor) too. My fundraiser did not require dog bones or Dixie cups! As Hubby and I stood and gazed in awe at this mess Blackie casually strolled by, looking like he didn’t have a care in the world. His body language just oozed innocence. “What noise?” he seemed to be saying. We think Blackie was lounging on one of the dining room chairs and when he jumped down he got a couple of claws caught in the tablecloth. Next thing you know almost everything that had been on the tale was now on the floor. The next few minutes was spent in a frenzy of tying to get the snack mix, and especially the chocolate candy that was in it, off the floor before the dog could eat much of it. Hubby and I also laughed quite a bit as we cleaned up. After all, nothing was broken, thank goodness, and it is a good story!